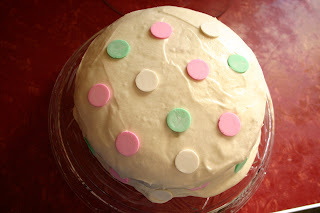 The cake was decorated with Necco wafer candies, giving it a nice polka dot look. Unfortunately, I made the frosting too thin & it was just sliding off the cake. Looked a little like a flying saucer from the side. Oh well. A little party craft. Good ol' paint brush & glue. They decorated their own crowns. A quick wardrobe change for Sadie & it was time for singing & cake. 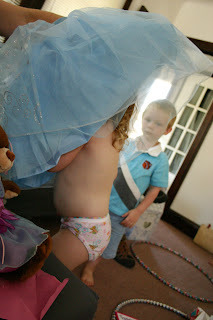 And yes, this is Sadie changing into her new Cinderella dress right in front of all her party guests. LOVE IT! You did work your bummy off! I love the picture of Sadie changing into her new dress infront of her guests! Love that girl. I'm so glad her party worked out so well. Awesome. I was hoping you'd post those today. What a nice blogging treat. That boy in the last picture has the look of "woah. Is that what a girl looks like. Maybe I can get some of those undies. I wonder if they come in my size..." on his face. What a beautiful party - you must have been busy!! Everything looks fabulous - love the pom-poms (might have to try that), the goodie bags are so cute and the cake is adorable. That looks like Sadie had fun! And I love that girl too. Changing into her dress up clothes. You did a great job on everything!! So adorable. I bet Sadie loved it! WOW! Those pompoms came out sooo great! 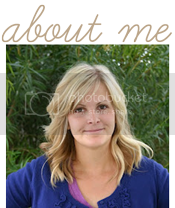 I am intimidated by Martha- I never think it will come out as good as hers, but look at you- they are awesome!! SO festive! The cake and bags were so cute too! Sadie is absolutely darling- love that three year old costume change- twice! She rocks! HAPPY BIRTHDAY TO HER!!! It looks like the perfect little Sadie birthday party. Good job, Candace! Impressive my friend! That turned out amazing. Sadie looked so happy!!!! that looks like fun. i love kids parties. and the cake is cute too. I love those pom-pom decorations. Such a fun party! It looks like you've made a lot of new friends there. awesome idea about the necco's...totally going to use that in the future. Ella did the exact some thing at her party...changing into her princess dress. You're such a cool mama! Love it, Love it, Love it!! I just threw my son a party. 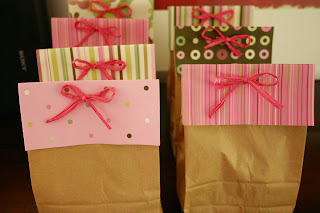 I love your goodie bags - they're so cute. 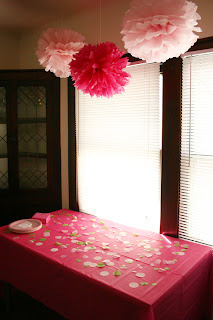 did you buy the pink hanging decor or make it? 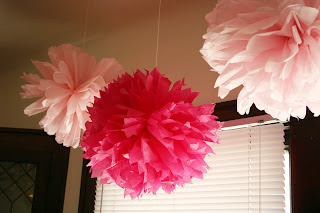 Just found you from Tip Junkie and I love your hanging poms! What a cute party. Love the hanging decorations - too cute! 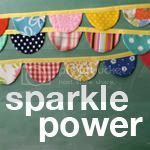 I know this party happened a long time ago, but I just saw this link from tip junkie. The bags are so cute. I might have to steal that idea. 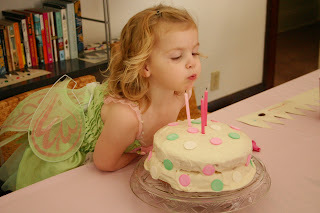 Anyways, to keep a cake from sliding, just take two or three drinking straws, push them into the top of the cake going all the way down, then snip them level with the cake before you decorate. 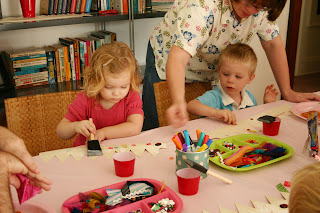 Love those party ideas! Nothing is cuter than polka dots! And those goodie bags and puff balls from the ceiling are wonderful! !